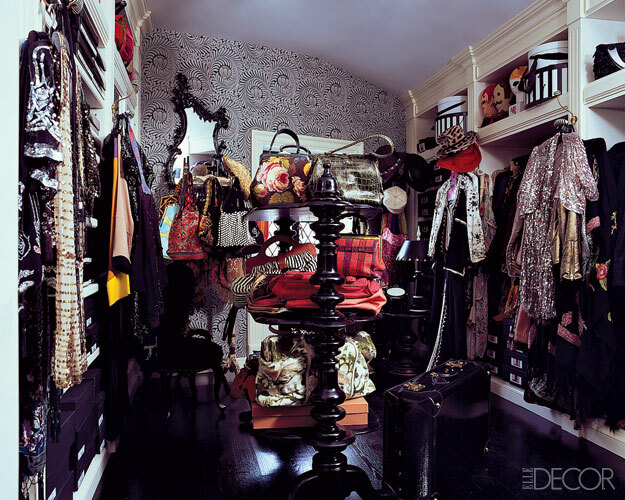 Have you ever looked at those dreamy celebrity closets and found yourself star struck not at the celebrity themselves, but at their AMAZING closets?! Well me too. One of the hardest parts for me in our entire down size was figuring out how and where to put all of my "stuff" in my closet and yet have it still somewhat resemble those dreamy high end, uncluttered, totally organized closets that we find in the pages of magazines. 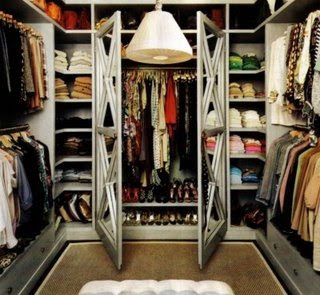 To start with, a dream closet has to feel like a dream closet. It has to exude glamour so that we feel amazing while we are getting ready. It has to have lots for places to put all your shoes because let's face it don't we all have a ton?! And let's not forget that we also need a place to put all our purses and bags (next to all our shoes). You have to make sure that you have ample room to hang all your clothes both high and low. Make sure you add tons of shelves to neatly fold and stack your clothes on, extra storage is key. You've got to have a big dresser right smack in the middle to store clothes, undergarments and jewelry...and of coarse to put fresh flowers and a candle on! Then add trays to organize all your gems in. 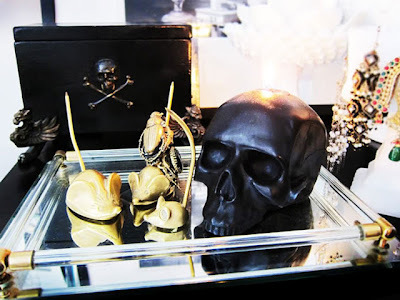 AND place this on top of your dresser for more accessories and a little edge. Everyone needs a place to sit so add a pouf , or better yet a big comfy pink velvet chaise. You MUST add a large gold mirror to see yourself in. Then add a huge glamorous chandelier preferably in black. 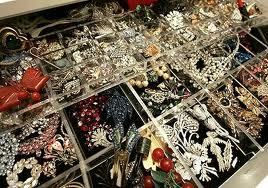 Next add somewhere to showcase your outfit du jour by adding pretty hooks to the sides of your closet. Make sure you have ALL matching hangars in there. No wire dry cleaning hangars allowed! Lastly, throw down a big awesome rug! That's it, pretty simple right? 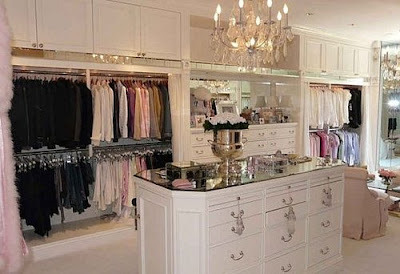 Just so that we're all on the same page, Part II of My Dream Closet will be the reality check! 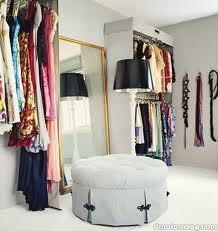 How to make a small closet in to your dream closet on a budget! Stay tuned. 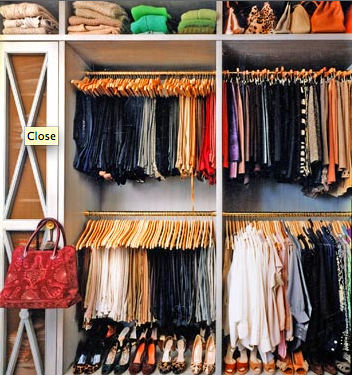 Wow, I can't wait to see your dream closet on a budget. Might have to "steal" your ideas. I need a closet makeover on a budget!